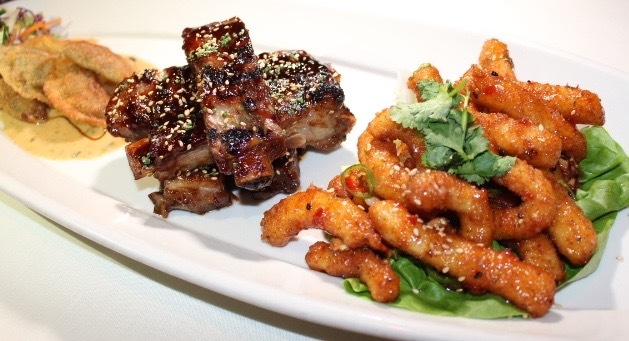 I have to confess to having never dined at a Roy’s before, even when vacationing in Hawaii, where acclaimed Chef Roy Yamaguchi’s Pacific Rim restaurant got its start. Although there is a Roy’s in Fashion Island where I shop frequently enough, I never found my way there. Perhaps because if I’m at Fashion Island, it’s normally during the day and my perception has been this restaurant is on the pricey side and therefore more of a dinner sort of a place. 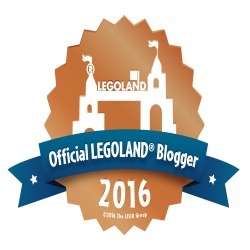 This changed recently when I was invited to try Roy’s for lunch with a few fellow food bloggers and writers. So off I went and I soon discovered that Roy’s had only very recently started serving lunch, which is great because this high-end chain now gives folks a chance to try their menu at perhaps more budget friendly prices. Upon arriving we were seated in the cool and dimly lit dining area, where we were presented with the new lunch menu featuring some of Roy’s popular dishes carried chain wide, as well as several dishes created by this location’s very own Chef John Vega. 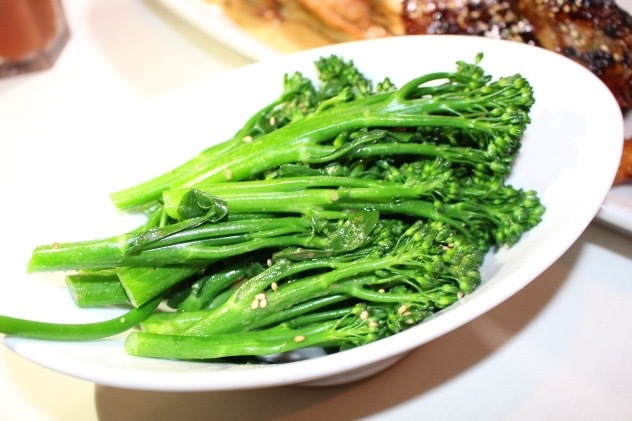 Chilled Broccolini with miso dressing and toasted sesame seeds. I am always a fan of broccolini! Edamame with togarashi, sea salt and sugar. I can eat these like popcorn. 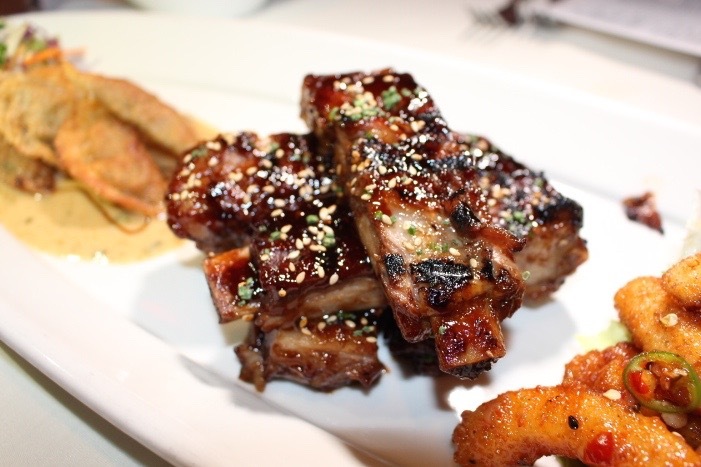 Szechuan spiced pork ribs. Smoked and glazed in Mongolian Sauce with Sesame seeds. 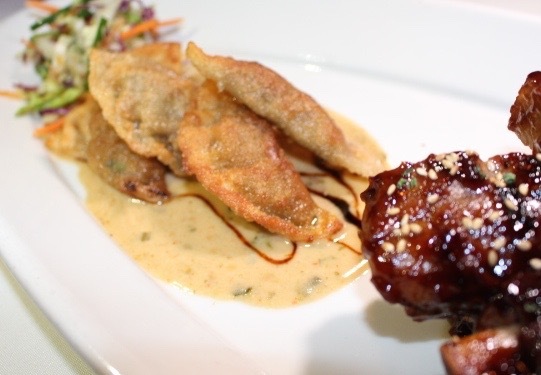 Sticky and flavorful. Lobster Potstickers with spicy togarashi miso butter sauce and onion shoyu dressed slaw. 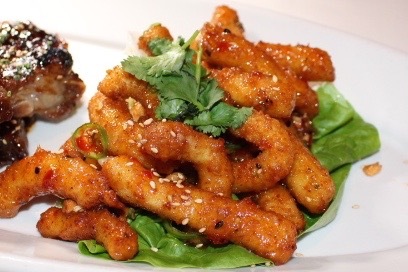 Fried Szechuan calamari with candied macadamia nuts, Serrano pepper and sweet Thai chili glaze. 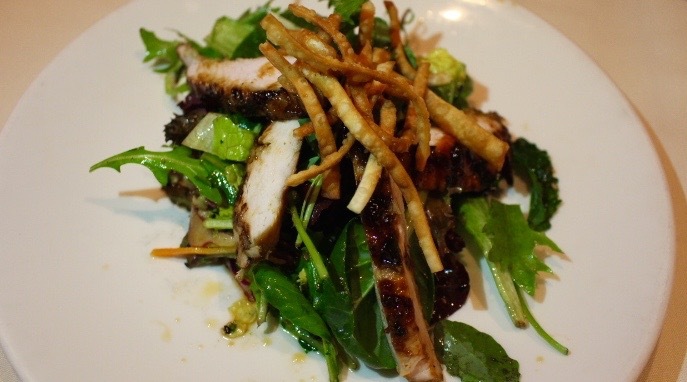 Our appetizers were followed by Grilled Mongolian Chicken Salad with crispy wontons, candied pecans, cabbage and sesame shoyu dressing. We then selected from the entrée portion of the menu. 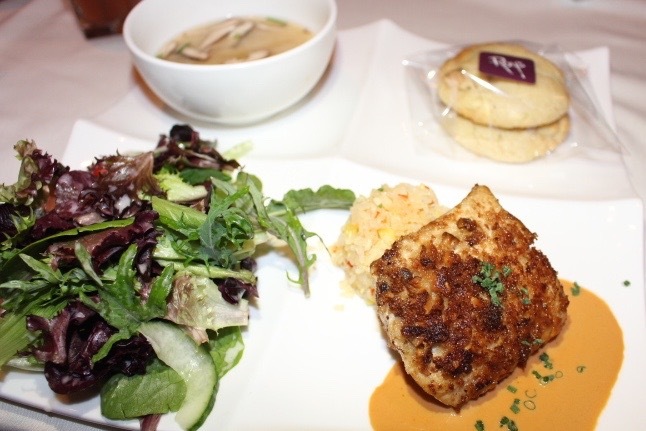 I went back and forth between the Misoyaki “Butterfish” Lettuce Wraps with cucumber, carrot, bell pepper and sizzling citrus soyu sauce and the Macadamia Nut Crusted Mahi Mahi from the Lunch Plate portion of the menu which comes with miso soup, green salad, pineapple fried rice, and a fresh baked cookie. I decided to go with the Macadamia Nut Crusted Mahi Mahi with chopped chives and a delicious lobster cream sauce. This lunch sized portion was perfect and I would order it again. For dessert the lunch menu options include dessert Kaffir Lime Tart, Kona Coffee Custard and Chocolate Torte with raspberry sauce. We went off menu though with Roy’s signature Moulton chocolate soufflé. 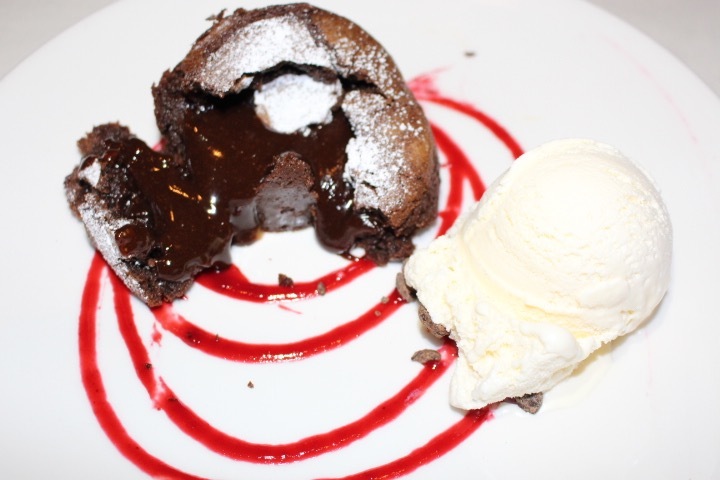 This popular dessert offered on the dinner menu is for the chocolate lover and if you fall into that category, you’re advised to place orders for this one at the beginning of your meal to allow for prep. Lunch is now served each weekday from 11:00 a.m. to 2:30 p.m. at this location with dinner service beginning at 5:00 p.m.